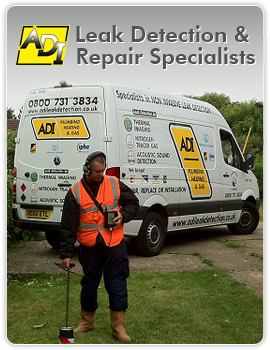 At ADI Leak Detection London we use only the very best of equipment when it comes to finding water or gas leaks on your property. This combined with years of experience and a very highly trained team of leak detection engineers means that you’re getting the absolute best possible leak detection solution at a price you can afford. When it comes to finding a leak there are two ways of approaching the problem. Firstly there’s the “hope and pray” method where you keep digging around until you get lucky. And then there’s the ADI approach where we use cutting edge leak detection technology to ensure that our work is as non invasive as possible. When it comes to non invasive leak detection our acoustic leak detectors are the pinnacle of this type of work because this type of equipment literally listens out for leaks behind walls and underneath floors. The sound intensity of a leak is proportional to the actual leak itself or in layman’s terms – the louder the noise the worse the leak is. This equally means that small leaks make almost no noise and are extremely difficult to track down with conventional tools and techniques which is why acoustic leak detectors are essential in this type of work. Our mission is to provide you with the most cost effective and time efficient leak detection that you can find anywhere in the UK. And we strive to achieve all of this with the absolute minimum interruption to both your personal life, your business life and your property itself. What Protection Do ADI Customers Have?